Below are Box Office Collection Report of bollywood film Baahubali 2 With his review, budget and total box office and worldwide collection status. Baahubali 2 movie lead star cast is Prabhas, Anushka Shetty. Baahubali 2 is an indian Action, Adventure, Drama Film of 2017, directed by S. S. Rajamouli & produced by S. S. Rajamouli, Arka Media Works. Karan Johar tweeted that Baahubali 2 Hindi version of has done better than expected and earned Rs 128 crore in three days. 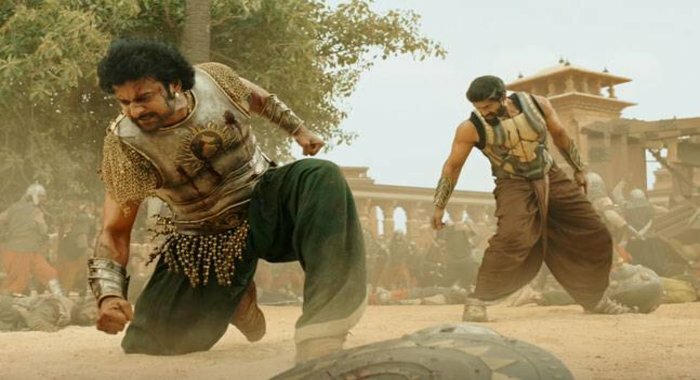 The reports about how it is faring in India and abroad continue to the come in, it has been established that Baahubali 2 has become a phenomenon. The film opened at 9000 screens worldwide. Obviously, if assessment and probabilities proved to be true, which is almost certain, then 'Bahubali 2' has left behind the life-time collection of Aamir Khan's 'Dangal' in three days. To maintain a new record, Aamir Khan will have to work very hard. The history of India has made the Bahubali film a lot of history. Prior to today, excitement was not seen before seeing such a movie in the audience. (1) Indians shoudl be proud of such a movie being made within the country, and it deserves to be teh biggest blockbuster so far . Watch it for the grandiose story telling !! (2) awesome movie.. enjoyed every minute of the show.. Amazing Vfx .. Indian Cinema is evolving..
(3) Great movie with giant action....awesome vissual effects...full to paisa vasul..
Aaj ye film Hindi film industry ke liye meel ka patthar sabit hui hea. Ab to ye 1500 Crore bhi kma chuki hea. A good post & Information here.